A Belisha beacon is a yellow globe lamp atop a tall black and white pole, marking pedestrian crossings of roads in the United Kingdom, Ireland and in other countries historically influenced by Britain. 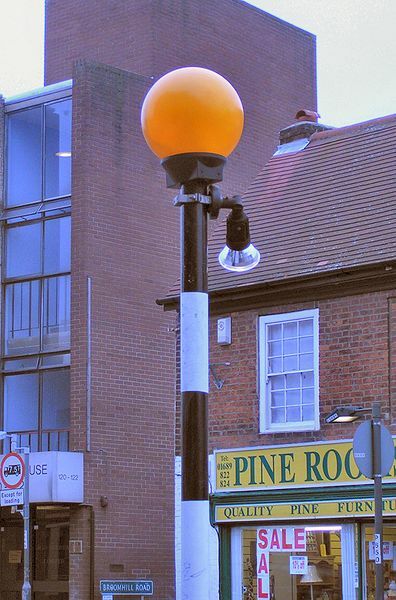 It was named for Leslie Hore-Belisha (1895-1957), the Minister of Transport who in 1934 added beacons to pedestrian crossings, marked by large metal studs in the road surface. These crossings were later painted in black and white stripes, thus are known as zebra crossings. The rule of thumb is that pedestrians have the right of way (over wheeled traffic) only on such crossings.